The transition to life back in the States feels surreal. The sights, flavors and people of Spain have turned into a dream. I miss my morning ritual of café con leche on the balcony of our L’Eixample apartment, overlooking students chasing balls and residents drying laundry. I’ve returned to my American morning habit of strong Starbucks coffee (with fresh ground beans) and last night’s 11 PM aircheck. Then driving to work before sunrise. I have my vacation photos. I nearly filled up my iPhone 4 with all the files. Totally worth it. Now, I can look back at the best meal of my life. This is part of Lasarte’s tasting menu. And – This is the first part of my entry for the Photo Sunday challenge: Delicate. 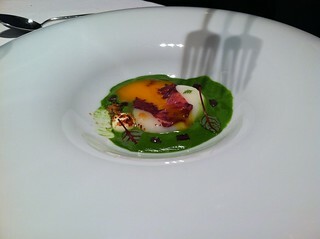 Basque cocido carpaccio covers a poached egg. It swims in a pool of liquid herb salad, dotted with beet root cubes. It’s paired with smoked cheese. 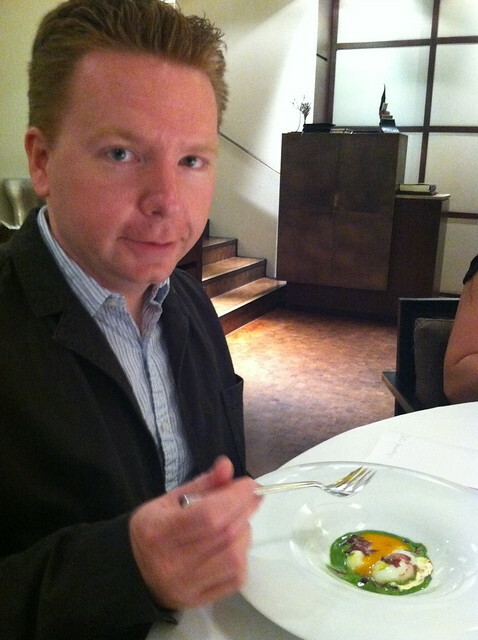 With a poke of the fork, this gourmet art work is transformed into a golden chef d’oeuvre. It was a crowd-pleaser at our table. 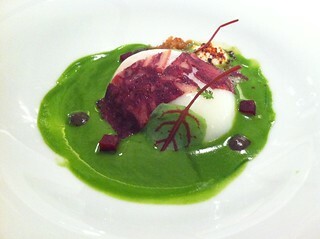 Everyone seemed giddy as they mixed yolk with green herbs and beets. One bite tasted both light and rich with the egg and meat mixed in. I love to cook and to eat too.